I need some help before getting into a potential mess! ForumsArrowLandlord Forums & Rental Property QuestionsArrowI need some help before getting into a potential mess! The word is "Similar"......... Well, every business is "Similar" in a lot of ways. They have customers, cash registers, traffic, goods, items, etc. ... No matter what I put in there can be considered "similar"....... Because of this, they can break the lease or take actions against me at any time, right? They want total control over the entire building, but only want to rent half of it..... It might be very difficult to rent out Unit 2 with all of these restrictions. This is my very first rental ever, and my very first potential tenant ever.......What would you guys do? t) Any other non-professional use similar to those listed above. C. Each party acknowledges that Lessee may suffer irreparable damage in the event of a breach or threatened breach of any paragraph of this Article. Accordingly, in such event, Lessee shall be entitled to seek preliminary and final injunctive relief, as well as any and all other applicable remedies at law or equity, including the recovery of damages for a breach of the paragraphs of this Article. Additionally, Lessee shall have the right, but not the obligation, to cancel/terminate the Lease, without further liability to Lessor, if Lessor breaches the paragraphs of this Article, and further Lessee shall be entitled to damages from Lessor, including but not limited to the cost of relocating, real estate commissions, tenant improvement reimbursement at the current Premises, tenant improvement at the new premises, loss of business, etc. Here is a photo of our office building below"
This is common. What financial services company trying to build a trusted reputation wants to be next to a business that takes away from that. 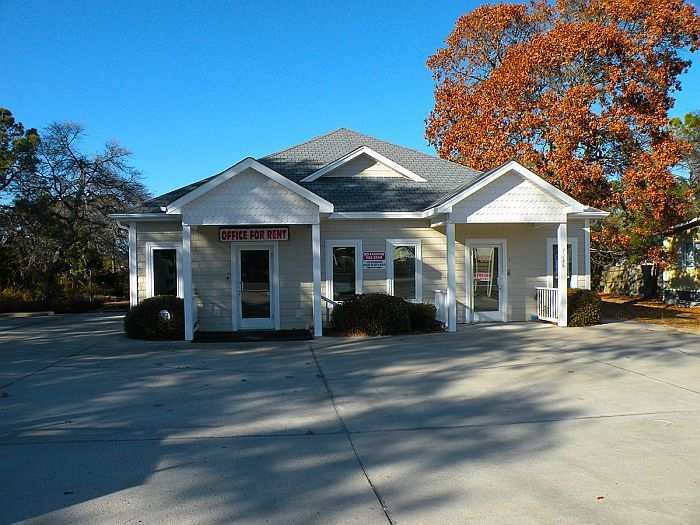 Are you going to a dentist that has an office between a pawn shop and an adult video store or are you going to the dentist in a nice office park? I didn’t look at the exact language mostly because I don’t know your particular location and market to best understand what is best for you in this situation. I just wanted to point out that these clauses are common and businesses want to be near other similar types of businesses especially when they are trying to protect a brand image. Best bet is to have a local commercial broker discuss with you the most likely use cases for your building. Who typical tenants are, ect. Also you really need a commercial real estate attorney on your team to do leases like this. In CRE the value of a property is almost entirely driven by the leases that are in place so it’s not a place where you want to skimp out and try to save a few bucks by not using an attorney. And to more specifically answer your question, they are focusing on “non professional”. If your building is best situated for an insurance agency, HR block, law firm, or whatnot then you won’t have an issue. Just have an attorney look at the language and see if they want to tweak it in any way to give you more rights and protections. If you want or think you’ll need these “non professional” businesses then it may not make sense to have a financial company in there even though the rent payments might look good at the moment. In commercial, tenant mix is just as important to the tenant as it is to the landlord. You need to (reverse engineer) this. They want the space and want you as a landlord but do you want them?? A. Section I am not as concerned about. B. Section there are some quality tenants listed they are trying to exclude. You need to perform a (highest and best use) analysis on the property. There might be a national tenant that would take all the space. I would not let a potential tenant dictate to me for a 5 year lease who is going in on the other side and basically hold hostage my cash flow stream. I would rather leave it vacant. From the picture it is hard to see access to your property, site lines,and available parking. If you try to resale later on a 5 year lease is nothing. Tenants try to do that and options to give ultimate flexibility to renegotiate TI or rents upon options or they might move elsewhere. That is why you want 10 to 15 year commitment with strong guaranty. You then could have a salable asset down the line a buyer could get a decent loan on. If you are not that experienced at this juncture you might reach out to a retail tenant brokerage company for market guidance local to the asset and additionally a commercial retail attorney that has vast experience dealing with these types of tenants and negotiations on behalf of the landlord. Your leverage to an extent will be dictated on how many options the potential tenant has in the market. If you are (the location) they want then things could be in your favor. If you are one of 4 sites they consider equal in the area they are looking at then not so much. Some of the businesses they are trying to restrict is probably good for you as well in the long-term since there are not a lot of reputable businesses that want to be located next to an adult video store, etc. I understand their motivation for everything listed on B, although some are a bit restrictive for you. I would focus on who you want as tenants for your building, and then if your ideal tenants are not on that list anyways it is not a problem for you. However, if your ideal client might be on that list (e.g. the military recruiting office) then you should not agree to it. B(t) does not bother me since it says "non-professional use", but I would talk to a local real estate attorney to make sure you fully understand what courts have interpreted that to mean in your area. I have a meeting with an Attorney on Tuesday!...... I don't get the Psychological counseling, Military Recruiting Offices, or Hair Salon type of businesses. ....... Do they consider a Hair Salon as a "Dirty Business"?......... Everyone gets their hair cut...... The "Similar" reference is what bothers me the most. Everything can be considered similar in one way or another. ....... Sounds like a good way to get out of a lease to me. @Mike Lynch Smart commercial landlords do not allow tenants to provide the lease form and dictate terms. I guarantee you there are more items in that lease you should be concerned about than just the Restricted Use provisions and damages for breaching them. If a small balance retail center is sitting vacant for years then the owner either PURCHASED in the wrong area OR they are not managing the property properly. Small sq ft spaces fill up fast for great areas. When you are buying a retail center drive a certain mile radius depending on urban core, suburban, rural and then rate the quality and location of your center to others. If other locations have a bunch of high vacancy in the area then not a good sign. I will NOT accept the lease terms but promise they have say so what business you will have them sharing a wall with. The lawyer always came up with harsh words but may be the tenant is professional to meet you one on one. I will leave out restrict use all together. Did they disclose what monkey business they are in? We have more offers to rent the place!...... Okay, I will just tell you!........ It is Edward Jones and Associates. ...... At this point I am not feeling it. I feel more like they will own the place if I sign the lease! Exactly. Why is the landlord letting the tenant dictate these terms by providing their own verbiage? I'd redline that sucker and get to negotiating, but "similar" is way to abstract for me to be comfortable. I am curious what "quality tenants" you feel are being excluded? A lot of the tenants would not go in the next door smaller space but these tenants in some centers have been great tenants in the past. Karate studio, Veterinarian, Nail Salons, Gym's, Military Recruiting Office. Nail Salons especially I have hardly ever seen one go out of business. They stay full constantly from most of them that I have seen. Edward Jones is likely worried about parking ratio's and the mix of customers to the site clashing. While negotiating with Edward Jones you could slow roll it while seeing what the other inquiries will do. Remember there is rental income and then resale to think of. Even if you got for instance a little lower initial rent to start but had one or two national tenants brands to sign long term 10 year or more leases for the space then it can be much more valuable for cap rate on resale. Your small purchase price the resale might still be okay as you might have a cash buyer but still better to have long term security on leases when selling later on. Example: You have a 15 year primary term lease. 3 years in you decide to sell. Now you have a 12 year marketable lease. If you did a 10 year you still have 7 left. If you only did 5 years you now have only 2 years left and very tough to sell to a buyer with limited security and time left on the income stream. Doesn't every neighborhood need a quality rub 'n tug or methadone clinic? I love how they singled out Massage Envy as OK -- perhaps they haven't been watching the news. I used to own two of the "undesirable" businesses. Now I am down to one, and soon I will be respectable!! After posting these questions on multiple sites, blogs, and talking to several Realtors in my area this week, 90 percent of the people say "no" to this deal. If anyone is going to create this many restrictions, they need to lease the entire 2000 sq ft. building. This way, nobody with bother them at all.......... I have purchased books from the BiggerPockets bookstore......... One thing that I have learned is "The renter is not the boss"..... "The owner of the property is the boss", and should have total control of their property. @Mike Lynch What did the tenant say when you asked them about the clause? Re a nail salon next door: The toxic chemical fumes from it would drive customers away in short order, and probably make the other side uninhabitable. There would have to be substantial air quality concerns considered. google it. Jones just did you a favor by including that in their list, whether you rent to them or not.